So, resolutely turning her back upon the house, she set out once more down the path, determined to keep straight on till she got to the hill. For a few minutes all went on well, and she was just saying, 'I really SHALL do it this time--' when the path gave a sudden twist and shook itself (as she described it afterwards), and the next moment she found herself actually walking in at the door. Alice looked round eagerly, and found that it was the Red Queen. 'She's grown a good deal!' was her first remark. 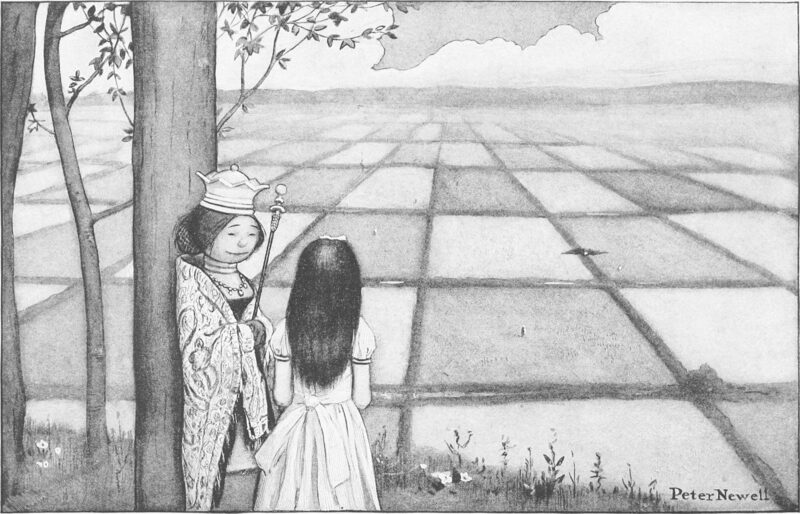 She had indeed: when Alice first found her in the ashes, she had been only three inches high--and here she was, half a head taller than Alice herself! She glanced rather shyly at the real Queen as she said this, but her companion only smiled pleasantly, and said, 'That's easily managed. You can be the White Queen's Pawn, if you like, as Lily's too young to play; and you're in the Second Square to begin with: when you get to the Eighth Square you'll be a Queen --' Just at this moment, somehow or other, they began to run. 'I--I didn't know I had to make one--just then,' Alice faltered out. 'You SHOULD have said, "It's extremely kind of you to tell me all this"--however, we'll suppose it said--the Seventh Square is all forest--however, one of the Knights will show you the way--and in the Eighth Square we shall be Queens together, and it's all feasting and fun!' Alice got up and curtseyed, and sat down again. At the next peg the Queen turned again, and this time she said, 'Speak in French when you can't think of the English for a thing --turn out your toes as you walk--and remember who you are!' She did not wait for Alice to curtsey this time, but walked on quickly to the next peg, where she turned for a moment to say 'good-bye,' and then hurried on to the last.